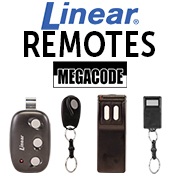 It's easy to find the Linear garage door opener remote you need with our complete lines of Linear Delta 3 and Linear MegaCode remote transmitters and receivers at Garage Door Supply Company. 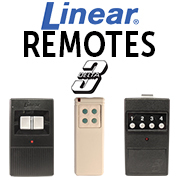 Just click on a remote to see our low prices and compatibility information to help find the right replacement for the make and model of your Linear garage door remote or Linear gate remote. We have Delta 3 Linear garage/gate opener remote control transmitters and receivers coded using dip switches. We have easy-to-program MegaCode Linear remotes and radio receivers with built-in rolling code technology that sets new codes every time you use your device. Choose a 1-button mini remote to control one door or gate. Choose a 4-button remote to operate up to four garage door openers or a combination of gate and garage door operators plus lights. Most remotes include long-life batteries and visor clips. You won't need a remote or a key to control your operator if you choose a keyless entry wireless Linear keypad.